Last week, the West Virginia House voted to impeach four West Virginia Supreme Court Justices after questions arose about expensive, state funded office renovations. 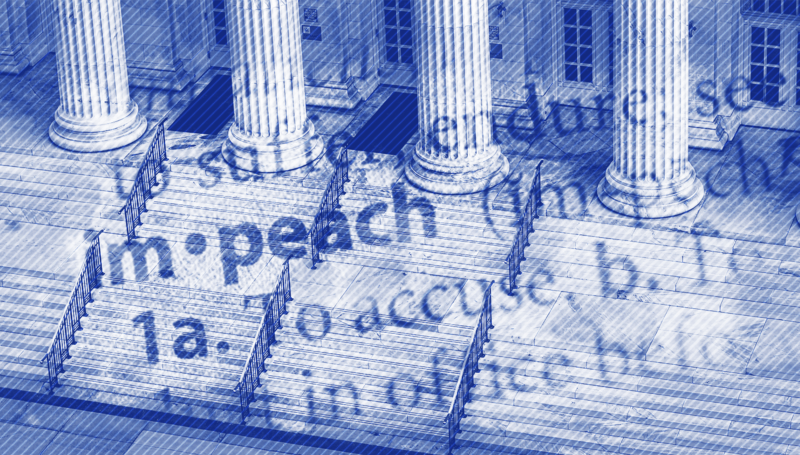 Ultimately, the accusations in the impeachment articles ranged from transporting expensive state property to a justice’s home, to using state funds on “lavish” renovations, to overpaying senior status judges, to generally failing to adopt policies to avoid such waste. The only justice not impeached resigned prior to the introduction of the articles of impeachment, and one impeached justice resigned after the House vote. Some allege the impeachment proceedings may be in part political. According to The Washington Post, some Democrats and advocates have “accused the Republican-led legislature of turning what they said was a legitimate pursuit of charges against [Justice] Loughry into a blatant attempt to take over the court.” Rep. Chad Lovejoy, said, “We’re talking about taking off the head of another co-equal branch.” If the Senate votes to remove the justices after their trials, Republican Gov. Jim Justice will have the power to appoint new justices, who will remain on the court until they must run for reelection in 2020. On Tuesday, the West Virginia Senate announced that it will convene on September 11th for the first appearance of the justices impeached by the House. West Virginia’s Constitution requires a two-thirds vote in the Senate to remove a justice; Republicans currently hold 22 out of 34 Senate seats. On Tuesday, following a lawsuit by Gov. Roy Cooper, a panel of North Carolina Superior Court judges blocked two constitutional amendments from appearing on statewide ballots as currently drafted. The amendments would substantially transfer power from the governor to the state legislature, including limiting the governor’s ability to select judges to fill judicial vacancies while giving a major role in the process to the legislature. Cooper alleged the amendment ballot language, written by the North Carolina legislature, was misleading. Attorneys for legislature had previously indicated they would appeal the decision if they lost. North Carolina Democratic Party Chairman Wayne Goodwin responded, “Threatening or intimidating or expressing potential retaliation for our justices and judges is offensive.” Woodhouse later said that he was not threatening the justices. The Judiciary Committee announced that the confirmation hearing for Supreme Court nominee Brett Kavanaugh will begin on September 4th, despite an ongoing dispute over document production. With the hearing date announced, television ad spending on the nomination has picked up, reaching over $4.3 million as of August 19th. Earlier this month, the Brennan Center launched a new SCOTUS nomination spending hub, tracking all digital ad spending in the Kavanaugh fight. View the latest numbers here. The next largest spenders are Demand Justice Initiative, which has spent just over $540,000 on ads opposing Kavanaugh, and the National Rifle Association, which has spent over $533,000 supporting Kavanaugh. Last week, in a speech to the Eighth Circuit Judicial Conference, Attorney General Jeff Sessions critiqued various decisions of federal judges and federal administrative law judges against the Trump administration. According to the Sioux City Journal, Sessions criticized federal judges’ rulings against the travel ban and the withholding of grants to sanctuary cities. Sessions argued, “I’m the top lawyer for the executive branch. It’s a co-equal branch. It’s entitled to proper respect from the legislative and the judicial branch, too… [J]udges aren’t sent from Olympus. They are not always correct.” Sessions also criticized federal judges’ use of nationwide injunctions, which were in place in the cases involving the travel ban and the sanctuary cities.